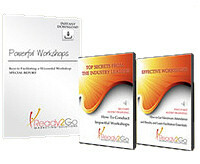 Special Report: From the Inside Out - Effective Ways to Manage Stress from Ready2Go Marketing Solutions, Inc.
Four products bundled at a special price: one Special Report, 2 Articles, 12 Success Tips and 60 Tweets. Nine products bundled at a special price: Special Report, Audio Training Program, Speech, Teleseminar & Self-Study (same content/different format), Webinar, Workshop, Success Tips, and Tweets. There's an insidious beast that's lurking right around the corner. If left unchecked and unmanaged, can lead to all kinds of relationship and financial problems, and can even bring about pain, illness and life threatening diseases. If you could develop a better understanding of what causes and reduces stress in your own life, it can pave the way for a more relaxing, healthier and happier life, both personally and professionally. 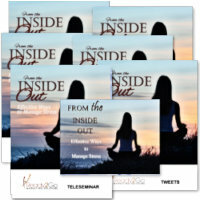 Special Report on How to Manage Stress from the Inside Out!